In what appears to be a familiar step in recent months a new graphics card has been spotted in the Eurasian Economic Union common trade manifests. If things follow the established pattern we will shortly see 3DMark, Geekbench, AoTS and / or FFXV scores followed by packaging shots and more in the run-up to release. This time it is the turn of the Nvidia GeForce GTX 1650 graphics card, more specifically the MSI GeForce GTX 1650 Gaming X. What is known about the GTX 1650 is very little at this time. Back in Feb we got to see some purported box artwork that Nvidia's graphics designers had approved for packaging. That was of course an early step in the process – no boxes can be finalized until this artwork arrives in various AIB art departments, and we haven't seen any finished box art of card samples as yet. In addition to the barebones box art elements we saw in Feb, shared by HardwareLuxx's editor Andreas Schilling, there came the assertion that the GTX 1650 would come packing 4GB of GDDR5. Since that time we have seen the launch of the GTX 1660, and it makes a lot of sense for the next card down to come in this config. The new EEC listing appears to confirm the 4GB spec thanks to the 'Gaming X 4G' and codename in the manifest. 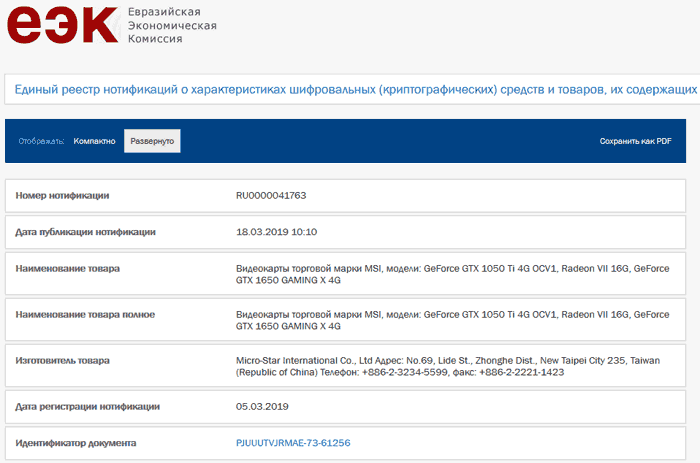 In the VideoCardz report on the EEC leak and the upcoming MSI GeForce GTX 1650 Gaming X, the 4GB of GDDR5 RAM is 'confirmed'. It is expected that the 4GB GDDR5 is connected via a 128-bit memory bus. Previously VideoCardz had pegged the GTX 1650 as featuring the 12nm TU117 GPU with 768 CUDA cores, but hasn't repeated that stat in its latest report. The video card centric news site might have become uncertain about the specs as it now asserts there will be an entry-level GTX 1650 model, possibly followed up by a GTX 1650 Ti SKU. The purported sub $200 pricing of the GTX 1650 (Ti) will help Nvidia squeeze competitor AMD's products currently found in this price bracket. Cards at around the $200 mark are very big sellers if successful, so it is an important segment to wrestle over. We are yet to see GTX 1660 and GTX 1660 Ti cards with less than 6GB of memory. Some 3GB cards are expected to arrive on the market at some time and will crowd the $200 region even more. It sounds like there will be a lot of testing, and required review reading for customers, to maximize the value possible from ~$200 segment in the coming months.